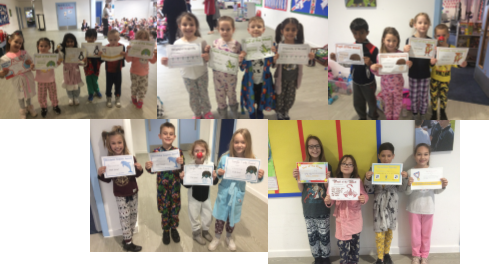 On Friday we celebrated Red Nose Day with a pyjama day. The children (and staff) were really excited all day, and thought it was great to be able to wear slippers at school! Thank you all for the donations of cakes, the children had a great time after school coming out to buy cakes, and most of them wanted to get something for their families which was lovely! We had a raffle during assembly on Friday too, the Red Nose Day cake was won by Eleanor in Year 4! Thank you so much to Tina for making and donating the cake for this cause. During assembly on Friday we also had Explore learning in to launch this year’s writing competition. The theme is ‘’Change the World’ and the children have been given entry forms to write their 500 word stories which will be judged by Alesha Dixon.